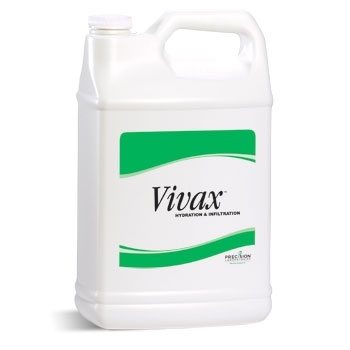 Vivax™ is a combination of new surfactant technologies designed to manage water across a wide range of soil and turf types, making it ideal for use on golf courses and sports turf. Apply 220 ounces (6.5 Liters) of Vivax per acre (.40 h) in sufficient water volume to ensure coverage. Apply 5 ounces (.15 Liters) of Vivax per 1000 sq. ft. (93 m2) in sufficient water volume.